This car seat is perfect for infant and no need for any other. It converts into regular seat with the ability to go all through their life. I love this car seat!! I am 5'1 and some other car seats were difficult for me to put the baby into due to the side being high. This one is low profile and easily accessible! I love the anti rebound bar as well. It's very well made, and I love the high weight limit and it's ability to convert to a booster seat! The size is great, I really wanted one that was a tad bit narrower for my SUV. Great seat! Much smaller than my previous chicco and britax carseats. This car seat is perfect! Look, fit, and comfort! ConsThe clip in the front is hard to open. I was given this All-in-one car seat to try as part of the weeSpring Parent Panel. I have a 2 year old so I was not able to try this car seat in refacing mode or the anti-rebound bar. I like the idea of a combo seat but not involving the infant seat. When my kiddos were little we had an infant car seat. In my option, it was very handy because you could pull baby and seat out without risking waking them. As far as forward facing in 5 point harness mode, I really like this seat. I have 3 kids that all needing car seats so it's nice that it has a slim design. One of my favorite parts about this car seat is, you can adjust the height and shoulder straps without taking it out of the car. The absolutely best feature is the crotch buckle. In other car seats I've used, either the crotch buckle can't move or it is so hard to move I don't move it. This seat has figured out how to adjust the buckle super easily without compromising it's ability. The designers of this car seat really thought through little details that make it user friendly. The only feature that is lacking is the release lever, to loosen the 5 point harness. There is not adequate room to release it easily. All in all I really like this car seat so far. I spent the last week carefully reviewing the baby jogger city view car seat, that we received as part of the parent panel on Weespring. We are critical when it comes to car seats considering we have 5 little ones! This car seat gets 4/5 stars in my book. The slim design of the seat is nice, it allows for 3 across on a bench seat in our minivan. It is super easy to install, and only takes a few minutes. While we were not able to use the anti-rebound bar, but I do think that this is a very nice feature for little ones. It will definitely protect them! 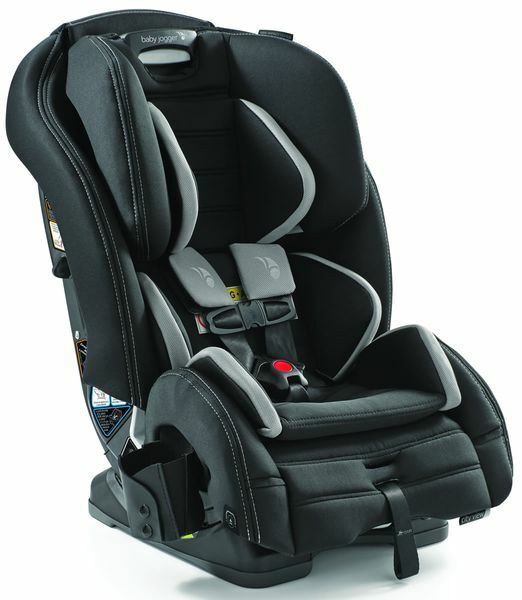 Safety is always our main concern in car seats and this one looks very well covered. The best feature of the car seat for us was the ease of use when needing to adjust the height of the seat, no need to realign straps, etc. just a simple pull of a handle and the seat lifts higher to adjust to our toddlers! Also, if you feel on the frame of this seat you can clearly tell it is built to last, and would hold up well upon impact. It feels very sturdy. We can see this seat lasting, we tested it on a one week road trip across the USA with both my one year and three year old trying it out. The 3 year old said that this seat was more "comfy" than his other so that was a big plus! Our 1 year old slept very well in it, no complaints. The only thing is the seat is slightly heavy, but this is what is expected when you get such a well built seat with a frame that will protect your child better than most on the market. It is convertible and made to grow with your kids, all the way to 100 pounds so we will be able to use it for many years! We are very happy with this seat and will be buying an additional one to go inside our van. Thank you for allowing us to review it. I'm on my fourth and final child for our family and wish I had this when we started. If it existed eight years ago I would have four of them right now! Right out of the box I could tell the car seat was great quality. It had all the removable padding for a newborn and looked really secure and safe. The car seat isn't heavy as you might expect from a car seat which can grow with your child. I've had others and its a struggle to get them in and out of the car for cleaning, etc. because of their clunkiness and weight. I used this first for me 20 month old who we had to move to forward facing in his current car seat because he is really tall. I installed this rear facing to see how'd he'd fit. This car seat gave him more leg room and he was very happy. I can't explain how it works out that way but the design allows him to actually be sitting further back from the seat letting him stretch his legs out more. Bonus points for safety! Next I swapped over to my 5 year old who sits forward facing. It was pretty painless to uninstall and reinstall. All the safety cords and latches loosened and tightened easily. I've struggled to get other car seats out once they are pulled tight enough but the straps on the City View had good hardware to make it easy. Since he is older I had to figure out how to install the cup holder which is definitely different from others. I couldn't find instructions in the manual nor on the website. I had to look around at pictures to get an idea of where it attaches and found a place you need to bend back the fabric to attach it just underneath. I wish they would add a blurb in the manual to explain how to do this. In my search I pulled back the bottom fabric and broke one of the removable fasteners for it. Other areas use snaps which work great and I wish they would have used those all around for uniformity. Once that was settled my 5 year old was happy. He can get in and out on his own and its easy to tighten and loosen the 5-point harness. One of the big pluses of the City View is the slim design. Like I said, I have four kids and car seats take up a lot of room! There isn't any reason to make them so bulky and Baby Jogger understands this. The car seat takes up as little space as necessary and doesn't protrude out beyond the seat. I used this for both kids in the single middle row seats of a minivan. I could tell right away the other kids can get slip through in and around to the back more easy. I'd bet you could comfortably get two of these in a single row and still be able to use the seat between them. Mostly impossible with most other car seats. The biggest bonus of selecting this as your car seat would be the fact it will grow from newborn to infant, to toddler, and until they no longer need a booster seat. I've gone through so many and was always frustrated I had to buy another expensive car seat at each life stage as they grew. This car seat is worth the investment for longevity and superior design! I received this All-in-one car seat from the weeSpring Parent Panel but my opinions and review are 100% honest. I will recommend to everyone I know having children to start right and purchase the Baby Jogger City View Car Seat! This new carseat helped us keep our current car! I just had my second daughter and the main challenge related to carseats for us was how to fit the one we already have for our 2.5 year old plus a new one for our newborn. We own a medium size car and we were worried how we would be able to fit both and still have some room for me in the middle to help with the kids. Besides this car seat having everything we were looking for, like solving the needs for all phases from baby to kid and also looking great and feeling very solid and safe (specially with the anti-rebound bar, love it), the fact that it's a bit more narrow and still very comfy really simplified for our family. I'm planning to also buy one for my toddler so we have a bit more space on her side as well. My husband installed with no problem and it works great rear-facing or forward-facing. Many thanks to the weeSpring Parent Panel for providing us with this all-in-one car seat! This convertible car seat is absolutely amazing! We drive a smaller sedan and the back seat is always crowded when people ride with us so I was worried about anyone being able to sit in the back with a car seat! The baby jogger city view is just the right size if you have a smaller back seat. It is not as wide as other convertible seats I've seen so the other passengers aren't squished! Also, as a safety conscious mom having the rebound bar makes me feel that much better while driving my little guy around! The placement of the little cup holder was perfect too! I was given this All-in-one car seat to try as part of the weeSpring Parent Panel and am so grateful! I would highly recommend this car seat to anyone with a smaller car! Easy to Install and Great Slim Design! Ever since my twins outgrew their infant seats I've been in search of a great "big kid" convertable car seat that is easy to install and doesn't take up the entire backseat. Of the three different seats I've tried, the Baby Jogger City View Seat comes closest to achieving these goals. I'm not sure the perfect seat actually exists, but the Baby Jogger City View comes close. -Slim, yet comfortable, design: The padding seemed very good in this seat, and both of my kids (20 months) tried it, and enjoyed riding in it. There are two recline options in the backward facing position, so you're able to position the seat in the most comfortable position for your baby/toddler. Additionally, the positioning allows some freedom for the driver (assuming you have to install behind the drivers seat) to adjust if they need more room for their own seat. Both my husband and I are on the tall side, which tends to make driving with a car seat behind us uncomfortable. Also, we have a car with a fold down third row which we use occasionally, but our other seats are so wide that we can't actually access the third row. This seat is narrow enough that if you position it behind the passenger seat and in the third row, then it's possible to access the third row. I didn't test this, but it looks like it would be possible to install three of these seats in the back seat . -Really easy to install: I'm terrible about installing seats, but this one was super easy to use (with a latch system). -Loved that it's easy to adjust: I was able to move the headrest position with a click of a button, rather than taking the whole seat out and rethreading the harness. To me, this is the most important feature in a convertible seat (aside from safety) since I plan to keep (and presumable adjust) the seat for years. -Safe: I didn't install the anti-rebound bar, but definitely would have used it if my kids were younger. I like that the seat offers this option. -Weight: This seat is HEAVY. It's easy to install, but it's not a seat you want to bring on vacation or pop in and out of a cab. -Cup Holder: Not super important to my, but it's a soft click on holder that doesn't really hold much. I use the cup holders on my other seat for toys and snacks, and that option isn't really available with this seat. Overall, this is great seat and I recommend it if you're in search for a convertible, slim design option. Thank you to weeSpring Parent Panel for sending me car seat to review! One word to describe this car seat- Easy! If you are looking for a quality car seat that is easy to install, easy to adjust, and comfortable for your kiddo, this is a great choice! The car seat was simple to adjust for a rear facing child. It took longer to look though the manual to make sure I did it correctly than it took to adjust it. I also loved how easy it was to install in the second row of our minivan. It took just seconds. I didn't struggle to tighten it down like some other car seats we have tried. The fabric is nice and seems to be high quality that will hold up well. The five point harness slid very easily when tightening and loosening the straps, which is a huge plus! I also liked the strap covers on this car seat better than any we have tried. They are a softer fabric and better design, so there is no pinching, which we have experienced with every other seat we've used. There was one drawback for me. The cup holder is mounted on the side of the car seat and it is a soft/flexible material. My 2 year old could not reach his cups in the cup holder, and the cups we tried did not fit well, or were hard to get in and out. This was a relatively small issue for us, as our son will hold his sippy cup in his lap most of the time anyway. Overall, I am so happy I was able to test this car seat out and look forward to using this seat for years to come. Thanks to the weeSpring Parent Panel for providing me with this All-in-one car seat! Amazing all in one car seat! I was excited to get this car seat because of all the features and slim design it has, and so far it has not disappointed us. I have a 20 Month son and he is currently rear facing in the center. The slim fit design of the car seat now allows my husband to put his seat back more when he drives (previous car seat the driver/passenger seat would clash if pushed too far back). It also gives passengers riding on either side of the carseat in my SUV a lot more room! I love the padding and how comfortable my son looks in this carseat which also makes me excited that our future transitions (front facing, booster, etc) will always be comfortable for him. I found that the seat was very easy to install and easy to position. A lot of car seats we have come across are easy to install but have a horrible positioning system and was always a pain trying to figure out the right position. I really like that the weight is up to 100 pounds and that this seat will last us awhile and keep our son safe! This is truly a one and done car seat and I wish I found this earlier. Thank you to weeSpring parent panel for sending me this awesome car seat to try! We love it! Slim and easy to use! This is the 5th convertible car seat I've owned over the course of 3 kiddos, and it's one of my favorites. It is definitely a smaller profile than most - the other "slim" carseat I have is about 19" wide, while this one is just under 18" - and while my other car seats are also significantly wider at the top - this one seems to have plenty of head room without sticking out all over the place - which is helpful when I have bigger kiddos trying to get in and around this car seat. What I particularly liked about the car seat is that it's very easy to adjust the height of the back - and that the shoulder straps move WITH the headrest when adjusting - unlike other carseats where I've had to rethread the shoulder harness through all the padding each time I felt I needed to adjust. While I'm using it as a forward-facing 5-point car seat at the moment for my 36 lb 2 year-old, I appreciate that it grows from rear-facing (and as an infant seat with nice, cushy feeling padding for little ones! ), to a booster seat. I think that the seat is certainly large enough (both wide and tall enough) to last my daughter until she's ready to be out of the booster. I also like that I can use the latches even while it's a booster and that the 5-point straps have a storage compartment as part of the seat (unlike others where I've had to detach and then lost in my garage somewhere....). Installing the seat is pretty easy - latches are super simple and it's pretty easy to tighten/loosen the straps. The back tether is especially easy to tighten and loosen! The regular latches are about average as far as ease of adjusting goes, and the seat is on the lighter side, making it fairly easy to carry when I have to switch it from car to car. Some things about the seat that I don't love - the cupholder is detachable and kind of flimsy (not hard, molded plastic). I'm not using it at the moment, nor do I think I'll use it in the future. I also feel like the bottom buckle of the harness either needs to have a wider back or some padding around or behind it - I've been very cautious as it seems like it would be easy to pinch a chubby thigh in the buckle - we've had a few close calls! That said, after receiving the seat to review as part of the weeSpring Parent Panel, I've been pleasantly surprised with it. It's replaced my previous car seat in my car and I would definitely recommend it to others! We received our Baby Jogger City View Car Seat and I was excited to try it's all-in-one features with both of my children. My daughter is three, 25 pounds and rear facing. I installed the car seat first with the anti-rebound bar. I thought she would hate it or pull on it, but it didn't seem to bother her at all. I did notice that the anti-rebound bar caused the car seat to hang slightly over the edge of my rear seats, so we didn't drive using this feature. I next installed the car seat rear facing without the bar and had some difficulty with the style of latch straps. They were easy to use, but I prefer individual latch straps instead of the double sided single latch strap used on this car seat. I also installed the seat using the seatbelt, which was easy to do as well. My daughter gave the seat a thumbs up and was sad when her turn with the new car seat ended. My son is 6, 37 pounds and forward facing. I adjusted the seat to his size and installed it forward facing using the latch. My son loves this car seat. He said it is really comfortable; he also loves the style and colors. His only negative is that he cannot buckle and unbuckle himself. The areas for improvement I noted were few and definitely things I could live without. Both of my children were pinched by the lower belt. I think this could easily be corrected by including a pad for this portion of the belt. I'm not a fan of the single strap latch system. I felt it was difficult to get a tight fit with the seat when I could only adjust one strap, but it could just be an adjustment from our older seat which had two individual latch straps. My favorite feature of the Baby Jogger City View Car Seat is that it is an all-in-one and can be used from birth through booster. As children age and schedules get busier, its nice to take car seat shopping off the list - as small of a task as that may seem. I think that the color selection and style are great for a seat intended to grow with the child. One of my son's biggest issues with being a first grader in a car seat is feeling like he's in a baby seat, but this is not an issue in this seat - he definitely feels like a big kid since the seat looks like a big kid seat. The anti-rebound bar is a feature I would have greatly appreciated when my children were younger and I was fearful that the car seat wouldn't properly protect them should an accident occur. It was also very easy to install and remove, but very sturdy once installed. I noticed that with the slim design of the seat there is additional space between my two car seats, which is nice, but what is better, is that my son and daughter can see each other better when using this seat. They were not able to see around their previous car seats. We are grateful to have received this product from the weeSpring Parent Panel. One car seat to grow with! This car seat is amazing! The best thing about it is that our baby can use it from 5 to 100lbs! With our first child, we bought an infant car seat and then had to purchase a bigger one when she outgrew it. This one will grow with our second baby and reduce the wasted resources of buying two. The straps are really straight forward to adjust, no more rethreading! That was the biggest bummer about our previous infant car seat, it was a pain to adjust as our baby grew. The City View also about 2" narrower than our other big kid car seat which makes it roomier for a third adult passenger to sit in the back with our two littles. Right now, our three-month old uses this in the rear facing position and the reclined angle is just right, he always falls asleep in it. I love the practicality and design, many thanks to the weeSpring Parent Panel for providing us with this all-in-one car seat! (1) The City View has a very nice simple and sleek design. I have the Mineral color and even though I usually prefer black or dark grey, it's a great neutral color. When I took the seat out of the box, I immediately thought it looked like a well made high quality product. (2) It is very easy to install. I have a toddler who is rear-facing and a young kid who is forward-facing. I installed the seat both ways via Latch and the vehicle seat belt and both were simple to do. The recline handle allows you to quickly change the seat angle from rear-facing to forward-facing to booster. With the headrest/harness adjustment handle, it is so easy to adjust the height of the straps. There is no need to remove the car seat and re-thread the straps at a different height slot as your child grows. At 19.5lbs, the seat is also relatively lightweight and easy to carry for travel. (3) I have a mid-size SUV and need car seats that are slim enough to have two side by side with room for an adult passenger or another car seat for a future third kid. The City View is not the narrowest car seat out there but it is narrow enough that I can fit a third passenger or car seat in the back row. The site lists the seat to be only 17.4" in width, however, when I measured it was closer to 18" across. If you had a more compact car or sedan, it might be too tight to fit three across. (4) The most important feature to me is to be able to extend the amount of time my child is in the rear-facing, forward-facing, and booster modes. In other words, higher height and weight limits. The rear-facing limits are pretty good at 40lbs and 1in below the headrest handle (which can extend quite a bit) so if you like to do extended rear-facing this is a good option. However, the height and weight limits for forward-facing and booster modes are less than ideal for keeping your child in a 5 point harness and booster seat longer, especially if they are taller or heavier than average. All in all, I do like this car seat. The convenience of having one car seat that looks great, is easy to install, and has unique features is really nice. While it may not be my perfect car seat, the City View is still a great car seat that I would recommend. Thank you to the weeSpring Parent Panel for providing me with this all-in-one car seat. Much to love in this all-in-one! I received this All-in-one car seat from the weeSpring Parent Panel. I have 2 other all-in-one car seats as a mama of 2, and this car seat brings together some of the features I found wanting in the others. The Baby Jogger City View is intuitive to use and easy to transition between the three settings of rear-facing, forward-facing and booster. I especially like that the seat back and straps adjust simultaneously with one hand to fit the seat to your child's height. The leveling features are obvious and the seat can be reclined and sat up easily, again with one hand, to match the clear indicators of correct position however you're using the seat. The instructions to attach the seat to your car are clear and the latch hooks are very convenient for attaching to the car seat bars if your car has them. The seat cover comes off with only some struggle, which is great for those unfortunate times your little gets sick or a bottle gets spilled; it can be washed with more ease than others I've tried. I also like the snaps and button clips that help put the seat back together as nicely as when you pulled it out of the box. I didn't notice that this seat was particularly slimmer than the other two I own. I wouldn't be able to fit 3 across in my compact SUV, but I doubt there are any car seats out there to answer that task. The fabrics and look of the seat are sleek but not "luxurious" so if your little is big on comfort, this may not be the seat for your cross-country car trip. Still, it answers the needs of our family and better in many ways than what we already had. We've been using the Baby Jogger City View Car Seat for about 3 weeks now. Install was super easy and I absolutely love that this seat came with an Anti-rebound bar. Safety is very important to me when it comes to choosing baby products and not many car seats on the market have anti-rebound bars. This is a huge selling feature for me. We also frequently have 2 people sitting in the back seat (PLUS our son's car seat) so the slim design appealed to me. Although I do have to say that after using this seat, I didn't notice a HUGE difference between the "slimmness" of this seat and the seat we were using before, but that is not a deterring factor to me. We looked at many many car seats and this one definitely is slimmer than a lot of convertible car seats. The one thing that I find frustrating when using this seat is the button that loosens the straps in order to remove your child from the seat is located wayyyy under the fabric of the seat and I find it hard sometimes to locate where the button is. Maybe I just have small hands, but literally my entire finger is engulfed by the fabric searching for the button in order to loosen the straps and get my son out of the seat. That being said, everything else has been a positive. This is the reason why I only gave 4 out of 5 stars. The convertible car seat we were using before the Baby Jogger City View, the button to loosen the straps is located on top of the fabric so it is very visible and easy to push. If the Baby Jogger City View had a configuration like this, I would for sure give it 5 stars because ease of use would be increased significantly for me. That being said, there are features that I find very easy to use - like the adjustable height of the headrest. It moves easily with just the push/pull of a button at the back of the headrest. Overall, I do think this is a great seat and priced very appropriately when you take in to consideration that you can use it all the way up to a booster. I like the fact that I won't need to go out and buy another car seat or a booster when the time comes, ultimately saving time and money. The main advantage to my family was the slim design - we are always using our car for camping and other adventures - we can use every inch of space possible. And, since it was easy to install, I feel confident we'd be able to move it around, if needed. The sleek design didn't hurt too - while not the most important feature in choosing a car seat, I appreciate an attractive, well-designed product. I've also used other products from this brand and have always had a good experience. For that reason, I was very excited when I received this carseat as part of a weeSpring Parent Panel. And, I have not been disappointed. The City View car seat is very impressive! It's slim without compromising comfort and fits nicely next to another car seat without being wedged against it or pushing it out of its space in the back seat. I was thrilled to see it had a one handed adjustment handle and in one second, had it adjusted to fit my 3.5 yr old. She loves the colors and the comfortable seat and headrest. One of the best features is the fabric cupholder! It attaches with a button on either side and for once, isn't in the way or causing space issues. Flipping it around for my 16 month old to give a test run, I instantaneously adjusted it to his size with a squeeze of the handle and attached the anti-rebound bar with a quick click. The seat feels very secure and safe with this feature and I only wish I had one all along! Another impressive feature, the fabric attaches with buttons near the headrest and can be pulled down at that access point so you can actually see what you're doing with the seatbelt when installing. No more blindly feeding a seatbelt through, only to find it tangled, all the while scraping your hand on the tiny plastic slot. The added padding for smaller babies/children attaches quickly as well with velcro. The fabric is very nice and the design has clean lines. It's a very well thought out seat. I feel like a true pro when it comes to installing car seats and this one was by far the easiest! I highly recommend this all-in-one car seat that grows with your child. It's nice to not have to switch out seats every year or so and just have one that can do it all! Thank you to the WeeSpring Parent Panel for providing me with this product! As a mom of soon to be four kids, I've gotten a bit jaded when it comes to car seats. It seems like they're all about the same, and the more expensive ones just have fancier fabrics or more padding. Well, color me pleasantly shocked by the City View by Baby Jogger! This car seat is not only a true all-in-one (from 5 lb infant to 100 lb high-backed booster), it is the most well-designed seat I've ever seen. No assembly required. No difficult re-routing of straps. No confusing settings for different uses and weights: it's all simply adjustable at the push of a button. Honestly, we didn't even need to glance at the instruction booklet to figure out most of the features (but the booklet is easy to understand as well!). I also appreciate the slim design (I'll soon have four car seats in my vehicle) and the great safety features such as the anti-rebound bar and the level indicator so you can see at a glance if it's installed correctly. I would definitely recommend this seat as the only seat you'll need to buy. Amazing! I received this product to review from the weeSpring Parent Panel, but my opinions are my own. I absolutely love this car seat. It was easy to install - the style of the LATCH buckles made it easy for me to install and adjust the seat. The slim fit left more room in the back seat for my other kids. The seat is well cushioned without being bulky. I also really appreciated how easy it was to adjust the seat to fit my almost 2 year old son. I wish I had had this car seat when he was in a rear facing seat. It is a great car seat. I received this car seat as part of the weespring parent panel. Thanks to weeSpring I got to review one of Baby Jogger's newest car seats to hit the market, The City View. It's supposed to be a space saving all-in-one car seat that can fit little ones from 5lbs up to 100lbs I first started out using it for my average sized, 26lb, 2 year old, in rear facing mode. It was pretty easy to adjust it to her size and I was able to attach the rebound bar pretty easily which by the way, I love that it comes with one. Very few convertible car seats have a rebound bar and I'm very happy for this added safety feature, but just know it should only be used rear facing. Installing it in my car was a breeze and my child seemed content being in it. Later on in the week I tested it out with my average sized 5 year old. Readjusting everything to forward facing was a little tedious with all the rethreading of the latch belt, but other than that the height adjustment was super simple with only needing to use one hand to adjust it at the right level. I thought the fabric material would be a little more premium but it's just like any other car seat nothing fancy. Now this car seat is pretty heavy due to the steel-reinforced frame so it would be a drag to have to move it back and forth from car to car. It comes with a really nice leather material cup holder but it is in an inconvenient spot and I found my children having a hard time being able to use it. It's supposed to have a slimmer design than other car seats but I don't see that much of a difference as other car seats. The base itself is slimmer but the seat area is still very much wide. Overall I'm loving that it's a very versatile car seat that I can use long term as an infant car seat to high back booster seat as long as my child doesn't pass 100lbs or 57" height wise. This is a great all-in-one car seat. It's the second brand we have tried. All-in-one car seats are like a miracle for us. We can't really be spending the money on several different stages of car seat for our two kids in two vehicles, so I am all for an all-in-one seat. There are several things I really like about the seat and a few that were just kind of an inconvenience. Things I liked about it include the rebound bar. I initially thought this to be kind of a silly addition to the seat, but once I installed the seat in the car, I liked how sturdy it was. It did make me feel like it was a safer seat. I found the seat very easy to install in my vehicle and loved the feel of the fabric. Also, the extra padding looks like overkill for an 18-month-old, but I found my daughter slept better because her head was supported much more than in her other convertible car seat. The slim design means that we will be able to put three car seats across the seat of our vehicle, which we will be needing to do in about 2 months. That alone makes this seat awesome for us and is my favorite feature of the seat. Finally, tightening and loosening the buckles is so smooth and easy compared to our other one, it is lovely. The small things that were just somewhat of an inconvenience include the cup holder, height of the seat, and leg room for my little. The cup holder is just silly to me. My daughter can't even see that it exists when it's dangling from the side. This seat is taller than our other one, which just means my husband cannot have the seat as far back as he likes when in front of the seat. Also, I feel like there is basically no leg room for a child over a year old. I can't imagine how a 3 or 4-year-old would ever sit comfortably rear facing in this seat. I would like to thank the WeeSpring Parent Panel for the opportunity to try this all-in-one car seat. First I want to thank weeSpring Parent Panel for providing me with this All-in-one car seat! This seat is amazing!!! I am in love with its narrow design! It's fits sooo much better in our car the extra space is great as we have a big dog and can use the extra room when we put the seats down. And now I can even comfortably put my seat back more as the previous car seat we had definitely did not leave me with much room...especially not for for long car rides! There is a push button latch which makes the installation process a breeze! The seat also comes with a removable cup holder which we like! We are definitely big on safety and this car seat has a unique feature which is an anti rebound bar which adds an extra layer of protection at first! I was worried how my daughter likes it but so far no fussiness which is a bonus in our books! We live in Florida so it's always so hot here and I feel that she is more comfy in this seat maybe do to it's chic makes and material its feels lighter! We received the mineral color which is nice! Definitely recommend this car seat! We had a car seat....but when we got this in the mail we liked it so much that it was a very easy switch for us! Our daughter is 28 months old and has been using a different all-in-one car seat for most of her life. It's been great and she seems to like it well enough but it is large and takes up close to half of our back seat. We received the Baby Jogger seat 2 weeks ago and are in love with it so far. First, it is much slimmer than our current one and we can easily fit two people in our back seat now. We installed the seat in the middle and I was pleasantly surprised that, even with the back extended since our daughter is tall, I can easily see over it and out the back window. The best part of the car seat, though, is how much our daughter loves it. When it arrived and we pulled it out of the box, the seat cushions felt very soft and our daughter seems to agree. Our second car is a sedan and there isn't a good way to install a mirror so that she can see us (and we can see her)...b/c of this, she doesn't love riding in it. With this Baby Jogger seat in there, though, we have sometimes had trouble getting her to climb out! My only complaint is that it took me forever to figure out how to attach the cup holder, but place most of the blame on my decision not to read the instructions. With how much she loves it and how compact it is, we are very thankful to the weeSpring Parent Panel for providing us with this All-in-one car seat. Thank You Wee Spring Parent Panel for providing me this product for review. I am all for simplifying my life with a toddler and newborn therefore an all-in-one convertible car seat is a great idea. I won't need to purchase a separate baby carrier/car seat for my baby and then purchase another car seat and booster seat as they grow. I like the slim design of the baby jogger all in one, yet the frame is steel reinforced providing the necessary safety requirements. Baby Jogger goes beyond and includes an anti-rebound bar as an extra added safety measure. I tested this seat with my 2 year old therefore his legs were too long to use the anti-rebound bar that attaches to the foot/bottom of the car seat. I love the easy installation using the LATCH system not to mention before I even put the car seat into my car, my 2 year old climbed into it and smiled, so I got the immediate thumbs up from him. The safety harness straps is a no re-thread adjust system that allows you to easily adjust the straps by simply moving the lever on the headrest. Some of the things that I did not like about it: You cant remove the seat lining to throw in the washer, it's spot clean only. The anti-rebound bar seems to be useful only with small infants. I would prefer that the extra safety measure was already somehow built into the car seat without having to attach an extra piece of equipment. Also the "leatherette" cup holder is a little on the flimsy side and only 1 is included. I absolutely love this seat. I was given this car seat to try as part of the weeSpring Parent Panel, but wish I had bought it a long time ago, instead of a convertible car seat that my son outgrew in 2 years. I love most that the seat can be so easily used for a newborn or for a 5 year old. I'm currently using it for my 3.5 year old, so its forward facing. Its so easy to install using latch or seatbelt, which I appreciate because I often take seats out to put in my parents car so they can pick up their grandkids from preschool. The design is nice - it looks and feels really nice, and is definitely slimmer than a convertible car seat, so it easily fits in all types of cars. I have not yet used it rear facing, so can't speak to that functionality but I do love that it comes with the anti rebound bar, and hope its just as easy to install as the rest of the seat. I was excited to get this car seat because of all the features it stated, and it is not disappointing. I have my 20 Month son in this and he is currently rear facing in the center. The slim fit of the car seat now allows my husband to put his seat back more and also the back rest more when he drives (previous car seat and driver/passenger seat would clash if pushed too far back). It also gives passengers riding on either side of the seat in my SUV a lot more room! I love the padding and how comfortable my son looks in this season which also makes me excited that future transitions (from facing, booster, etc) will always be comfortable. Another wonderful thing is that the weight is up to 100 pounds (weather your child likes it or not). This is truely a one and done car seat and I wish i fount this before now! I was given this All-in-One Car Seat to try as part of the weeSpring Parent Panel. I've been very happy so far with the City View car seat. Our 21 month old daughter is currently is currently in a convertible car seat that we have enjoyed, but our biggest complaint was how wide it was. The slim design of the seat is great for the backseat of our car. We struggle with our current seat because whenever anyone wants to sit in the back we have to make adjustments to the car seat, with the City View, no adjustment was needed and the person in the back seat had more room! It's also lighter then our current car seat, which makes it switching it from car to car much easier. I also really liked that this car goes all the way up to 100lbs, it really will grow with my daughter for many years to come, and making all the seat adjustments as she grows will be super simple with this seat. We will definitely be installing this seat permanently in my car and putting the wider seat in my husband's larger vehicle. I was given this All-in-one car seat to try as part of the weeSpring Parent Panel. This car seat is for children from 5-100 lbs. It can be used rear facing, forward facing, and as a booster. I decided that my 18 month old would be the one to try out the seat. At first glance, the seat appears to be sturdy, but also slim, which is a great feature for those who have to fit multiple car seats in their vehicles. As I carried the car seat to my car, I could tell that the seat definitely had some weight to it, but it didn't feel as heavy as the seat my daughter was previously using. However, it is not something that I would want to haul around every day. The initial features that I like is that there was no assembly required, with the exception of having to snap in the cup holder and the anti-rebound bar, which was very easy to do. I like how the headrest was easy to adjust, and that the headrest and harness adjust simultaneously. I like that I didn't have to re-thread the harness. Another great feature is that the seat covers come off and are machine washable. As far as safety goes, the seat includes an anti-rebound bar, which is not required for installation, but is an added safety feature. However, this feature can only be used rear facing. The headrest area is surrounded by foam, and the seat can be used in a 5-point harness mode up to 65lbs. It also includes the LATCH system, which made it easier to install in my vehicle. In addition, to those features, it seems to be very comfortable for my 18 month old, which is great because this seat allows room for growth. From the safety features, easy installation, and the minor details like washable fabric, I would definitely recommend this seat to others. We have one super-active two year old. He is incredibly difficult to wrestle into a carseat, so something that makes that easier is a big win for me. I also want my car to look decent, and not like my whole life has been taken over by my kid's stuff. That being said, I really love this car seat. It is elegant, attractive, and well-designed. The straps are easy to adjust and can buckle in a crazed toddler quickly and safely. It was easy to install the anti-rebound bar onto the seat and easy to install the seat in our car. I like the added safety of the anti-rebound bar. I hope we never need to test it, but it makes me feel good knowing it is there, and that the company did such extensive safety testing, beyond the minimum requirements. This carseat is a full three inches narrower than the other all-in-one carseat we were using. Our backseat can now comfortably fit two grown adults. The seat also has a lower profile so it is SO MUCH EASIER to get our kiddo in and out of the car without bumping his head on the ceiling. We currently use it in rear-facing mode, and I'm so happy that we will be able to use it hopefully until he is too big for a carseat in ten years or so. The only drawback is the price. I probably wouldn't have been comfortable paying this much for this product, hence why I took off one star. I was given this All-in-one car seat to try as part of the weeSpring Parent Panel. I received this All-in-one car seat from the weeSpring Parent Panel. We love the all-in-one seat and knowing that we can use it all the way through a high-back booster seat! The profile of this seat is slimmer than our usual car seat, so it would be able to fit other people or seats across the back easily if needed. I do like that this seat has the anti-rebound bar for (optional) use with rear-facing. This is a safety feature that many European car seats have, but we don't have many options here in the US. This seat only has two recline options for rear-facing, and two options for front facing. Because of this, I couldn't find quite the right angle for us in rear-facing position that was comfortable enough for my kiddo without encroaching on the front seat space. Setting up the seat was very easy, and I love the no-rethread harness which can adjust to different heights with just one hand. We didn't like that this seat doesn't come with a cup holder, and the holder you can buy for this seat looks like floppy soft material. I don't think that would work well for a toddler to get a cup in and out of. Overall, this seat doesn't work as well for us right now in rear-facing position (I think our back seat might be kind of difficult to fit). But I look forward to trying it again when we're ready for front-facing and for high-back booster. I think for the price, this seat would be worth considering with the extra safety of the anti-rebound bar and knowing it's covertible all the way up to high-back booster. What a nice all-in-one car seat! There are so many things to love about this car seat, particularly the safety features, versatility, and ease of installation and cleaning. The car seat looks very nice, and I love that it has a slimmer profile to take up a bit less space in the backseat of my SUV. I can definitely see the difference as compared to the other car seat we have been using. There is also quite a bit of nice padding, and when my 2 Ã‚Â½ year-old first sat in it, she immediately said it was "so comfy." My biggest priority with a car seat is safety, and this car seat seems to be top-notch in that area. The anti-rebound bar seems like a pretty smart addition to a rear-facing seat to absorb some of the impact from a frontal crash. The anti-rebound bar was packaged separately, but I just had to snap the bar into place before it could be used. Aside from the anti-rebound bar, there are some other very thoughtful safety features. The back of the car seat has a sticker to write in the child's name, medical information, and emergency contacts. The sides of the car seat have really nice, easy-to-follow stickers that identify important safety checks like proper headrest height, harness positioning, recline positioning, and LATCH system positioning. There is also a handy little level on the side of the car seat to assist with proper rear-facing installation. Another great feature of this car seat is that the harness shoulder straps adjust automatically by simply raising or lowering the headrest. No re-threading the straps through different slots in the back of the seat as the child grows. Nice! As far as installation, this car seat was fairly easy to install with the LATCH belt and had some smart storage spots for the belt clips and tether strap. Rear-facing installation only required detaching the LATCH system belt clips from storage bars on either side of the bottom of the car seat and connecting them into the LATCH anchors in my SUV. It took us a bit of elbow grease and about ten minutes to get the car seat installed properly the first time, but now that we are familiar with it, it should take much less time in the future. We have not installed the car seat in the forward-facing position yet, but the instructions to do so seem quite easy to follow. We did do a test run on moving the LATCH system belt up to the proper position for forward-facing installation, and it took hardly any time at all. I also liked that the top tether strap could be stored by simply clipping it in to a bar on either side of the car seat. One other very important feature to me is how easy the car seat can be cleaned. While I really like the look of this car seat, there is quite a bit of stitching on the seat pads. I have learned that such stitching and seams are a magnet for food. Thankfully, the car seat pads snap off and can be thrown in the washing machine! Removing and then reassembling the pads took me a bit of time and effort initially, but the manual provides fairly clear directions and diagrams to help. Just a few minor issues I have encountered prompted me to give this car seat a 4-star (more like 4.5-star) rating. While I like the anti-rebound bar overall, I am a bit nervous about using it with my taller toddler, who can still sit rear-facing. I don't like the idea of her sticking her feet in the gap between the bar and the backseat of my car, particularly if we were in an accident. Aside from that, the harness release is not very easy to find at first glance. It is hidden underneath the bottom seat pad and accessible through a slot in the pad that is not marked. It would be nice if there was some indicator on the seat to assist with finding the release lever. I also do not love the cup holder. While it's nice to be able to attach the cup holder to either side of the seat or remove it completely, I thought the holder seemed a bit flimsy and our toddler's wider cups did not fit in it. The angle that the cup holder sits at after it is attached to the seat also seems awkward (too low). My 2 Ã‚Â½ year-old does not have too much trouble maneuvering her narrower cups into the holder, but I could imagine it might be more challenging or cause frustration for a younger child. Finally, although the car seat has really nice body support inserts for smaller children, there was no pad around the harness buckle. While those pads can be a pain to deal with, I have come to appreciate them because they help prevent pinching. I have two other general observations. I love that this seat is all-in-one, meaning that it can be used at every stage from a 5-pound newborn to booster. Yet, it's hard for me to imagine that our infant (who was 6 Ã‚Â½ pounds when she was born) would fit well in this car seat during those first few weeks. Even the infant car seat we used seemed to engulf her at first! Now though, at two months old, she fits very well in this all-in-one seat. One final consideration with this type of all-in-one car seat (generally, not this particular one) is that I don't think it can be attached to a stroller/travel system, and there is simply no effective way to carry it around with you, like an infant car seat that has a handle. So, for example, if I took my infant to the store with me and used this type of car seat, I would need to bring a separate infant carrier or hold her while I shop. The inability to carry the seat with me makes this type of car seat a bit more difficult to use during the early stages, but it's a trade-off for the wonderful versatility this seat offers. Overall, I am a really big fan of this car seat and would recommend it, particularly to those looking for an all-in-one seat! Thanks so much to the WeeSpring Parent Panel for giving me the opportunity to test out this great car seat! I really love this car seat! The slim design is great for multiples. What's even better is this car seat grows with your child. I tried it with my newborn and also with my 22 month old. The car seat was safe, secure and also comfortable. The materials are quality, too which I love. I received this product from the weeSpring Parent Panel. All Around Great Car Seat! I love the idea of an all in one carseat because it saves me money in the long run. I don't have to worry about buying a booster seat or anything else because this one grows with my kid. We're about to have 3 kids and having a slimmer car seat is very important to us because we have to fit three of them in our SUV. You can tell that the base is not as bulky as others are and it makes a difference when installing multiple car seats. This is a big win for me! I hadn't heard of the anti-rebound bar prior to this seat and I love it. Having that added safety gives me a little more piece of mind. My favorite feature of this seat is how easy it is to buckle and unbuckle my kid! I can do it with one hand - for moms with multiple kids, thats a big deal! I love the all around design of it too, it's soft and the quality is premium. The reason I gave it 4 stars instead of 5 is only because my 19 month old can slide the chest bar down - I'm not sure if it's because I'm not tightening it enough or that I need to teach her not to do that. I received this product as a part of the weeSpring Parent Panel.